Frederick, Maryland, City Police and the Frederick State’s Attorney are investigating compaints about Mount Olivet Cemetery, following a News4 I-Team investigation that exposed questionable spending by cemetery employees. Mount Olivet is one of the most famous cemeteries in Maryland because there are some well-known names buried there – including Francis Scott Key, the author of the National Anthem. But the I-Team investigation pieced together leaked receipts showing purchases made on the cemetery’s tax-exempt credit cards, including a new roof, a new fence and multiple appliances, which the I-Team linked to the private homes of the cemetery’s superintendent Ron Pearcey and his stepson Rick Reeder, who also serves as the cemetery’s assistant superintendent. 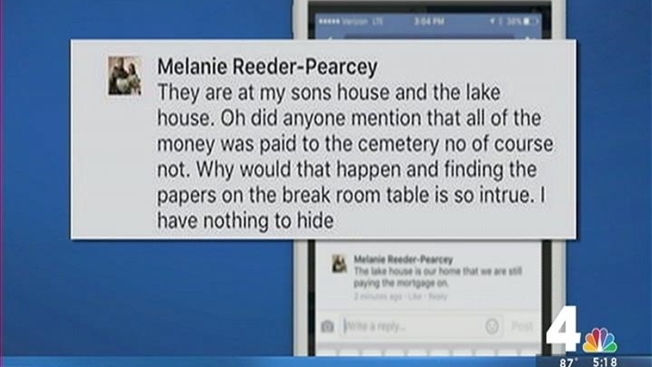 After the investigation aired, the superintendent’s wife, Melanie Reeder-Pearcey, made a Facebook comment in response to the story, saying the purchases the I-Team profiled “are at my son’s house and the lake house” at Lake Anna in Virginia. Reeder-Pearcey continued, “All of the money was paid to the cemetery” and “I have nothing to hide,” but she later deleted the post. When the News4 I-Team called Reeder-Pearcey, she confirmed she deleted the post but declined to explain her comments. The I-Team also heard from angry lot owners – people who purchased burial plots at the cemetery – who said they feel like Pearcey and Reeder misused their money since the bulk of the cemetery’s finances come from the sale of burial plots. At least one lot owner said he filed a complaint for theft with the Frederick City Police Department after watching the I-Team story. Frederick County’s prosecutor, Maryland State’s Attorney Charles O. Smith, also confirmed to the News4 I-Team his office is investigating the matter. Reported by Tisha Thompson and produced by Rick Yarborough.